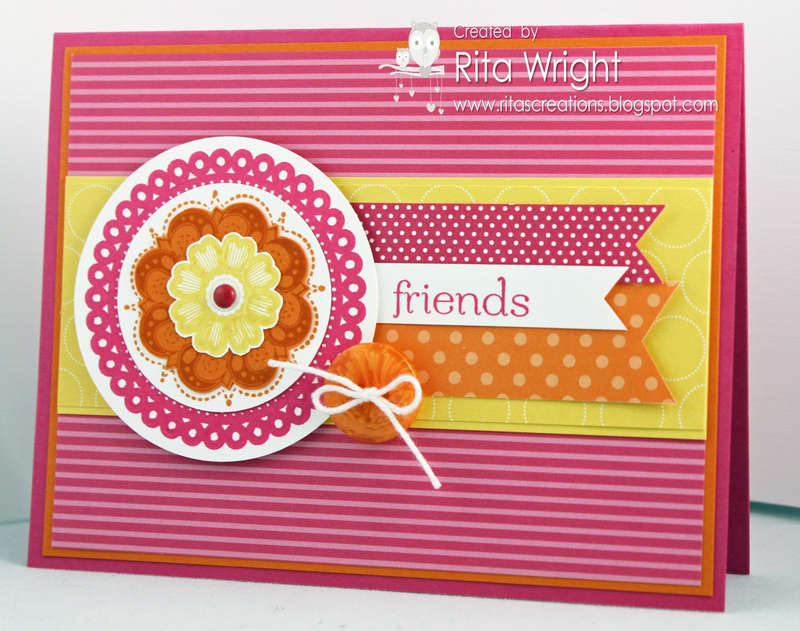 Cards by Rita: Lacy and BRIGHT! I finally found a little time to stamp last night and today. Laila has been taking some decent naps so I've had a bit of free time. I'm sure I could have been folding laundry, but that just didn't seem as fun. 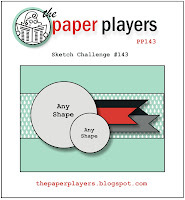 ;) I combined two challenges for this project, the inspiration photo at Stampin' Celebration and the sketch from the Paper Players. I finished it too late to link with the sketch challenge, but I wanted to note that I used it anyway. Kinda bright there, huh? I hope I didn't hurt your eyes. I needed some cheery colors this week, so that's why the inspiration picture was so perfect for me. The Brights collection is my favorite by far; they are just so happy. I made this for a special friend in Maryland who I haven't talked to nearly enough lately. She's been going through a lot of tough times, so I'm hoping it will cheer her up. My card was very inspired by a sample in the upcoming annual catalog. ;) There's some fun new stuff in there but also some great samples to make the carried over products fresh and fun. I want to thank all of you who emailed about my mom. I don't think they've even thought about going to the post office yet, but I can't wait to hear from her when your cards begin arriving. This month will be so hard for her as Granny's birthday is the day after Mother's Day. I have been talking with her every day to make sure she's hanging in there and we already booked a flight for her to come down next month to see Laila. I don't really know what else I can do from 18 hours away, but I'm trying... Granny will surely be missed. My mom is one of sixteen kids, so there's a lot of family out there missing her. Jason's co-worker got this cute outfit for Laila so I had to snap some pictures of her in it this week so he could show her off wearing it. I *like* the bright colors! Fits right in since spring has finally sprung where I am and I'm seeing tulips on my daily walk now. And Laila looks adorable in that yellow dress! I love this cheerful card! The layers and button are great! 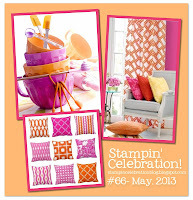 Thanks for joining us over at Stampin' Celebration! Love this..I've been following your blog for a long time and you have great designs! I think I'll try this with the new washi tape.....arrives wed! I love this! What a fun card with such bright, cheery colors! I know your friend will appreciate it a lot! Laila looks so cute in that outfit, I love the yellow top and jean leggins! Adorable! Beautiful and bright card but I got totally sidetracked by the 16 kid thing...........OMG! Your granny was much stronger than me! Bright and very pretty and know that your friend will love it and yes be cheered by it! Your mom appreciates all that you are doing for her just by being there and available on the phone....and her trip to visit you will cheer her up greatly! I love the look on Laila's face in her darling new outfit!!!!!! Take good care of YOU....it will have a trickle down affect on your mom too! LOVE IT! It makes me happy to look at it and all the elements of the card, SOOOOO great! Thanks so much for sharing with us at SC!